Nomaterra is inspired by travel and the opportunities, adventures and exploration that comes with it. 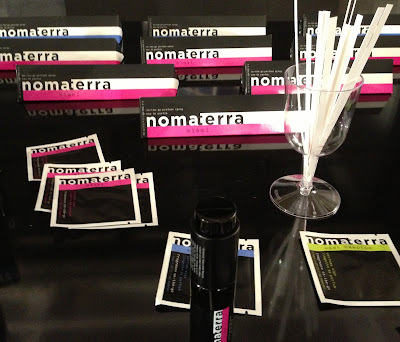 Nomaterra takes us on a journey through Miami, East Hampton and Washington D.C. - three fragrances in the Spring collection that are based on these locations. These three locations hold great meaning to Nomaterra's founder and CEO, Agnieszka Sygnarowicz Burnett, since Miami, East Hampton and Washington D.C. were the first three areas her family traveled to after arriving in the United States from communist Poland in 1986. Miami is easily my favorite scent, with notes of orange blossom, jasmine, melon, pink grapefruit and coconut. It's a fun and flirty, seductive fruity-floral scent that I can't wait to spray on this spring/summer. East Hampton has a clean and refreshing, sophisticated and elegant woody-floral scent, with notes of jasmine, gardenia, bergamot and white woods. Washington D.C. is boldly-scented with spices of nutmeg, bay leaf, and black pepper, balanced with a citrus-y opening and a warm vanilla and musk base. 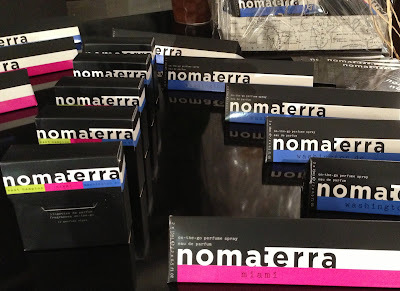 Nomaterra's "on-the-go" eau de parfum travel sprays retail for $110 and come in a modern 0.5 oz aluminum twist-up bottle and includes a 0.5 oz replacement. The spray is light enough to tote in your purse everyday, with no worries of leaking or breaking. What I really find unique are the fragrance wipes that can fit in your pocket or clutch. The fragrance wipes would be ideal when wearing delicate fabrics like silk, that sometimes get damaged by perfume spritzes and would also be refreshing during the summer. The wipe application more evenly distributes the fragrance, so you don't have to worry about having sprayed too much perfume or not enough. The fragrance wipes come as a set of 12 wipes in a portable flip box that retails for $36 and $3 individually. You can order samples, shop the fragrances and learn more at nomaterra.com.